Memorial Day weekend is a good time to relax reading a suspenseful, mystery-thriller spy book. 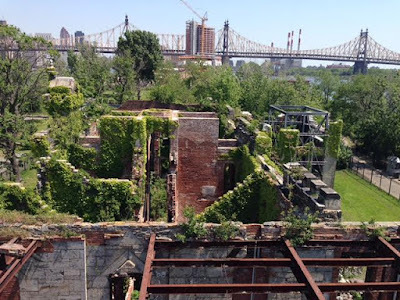 Even better if the book's hero lives on Roosevelt Island, the author is a Roosevelt Island resident and you can get a free download of the book through Sunday. Trains stop at W 4 St. The annual family friendly Roosevelt Island Day will take place Saturday June 11. Sponsored By Urban American, Roosevelt Island Operating Corp and Roosevelt Island Youth Program. 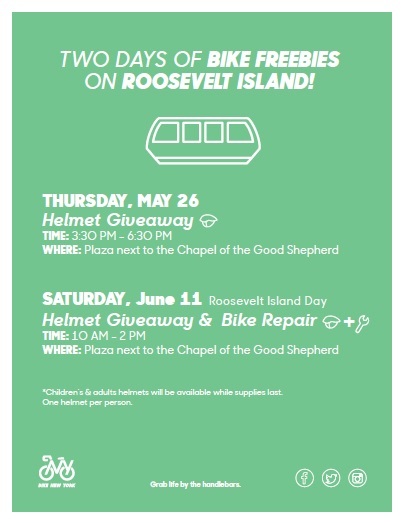 Also, Bike New York will have a Helmet Giveaway as well as a Bike repair shop for Roosevelt Island Day at Good Shepherd Plaza. 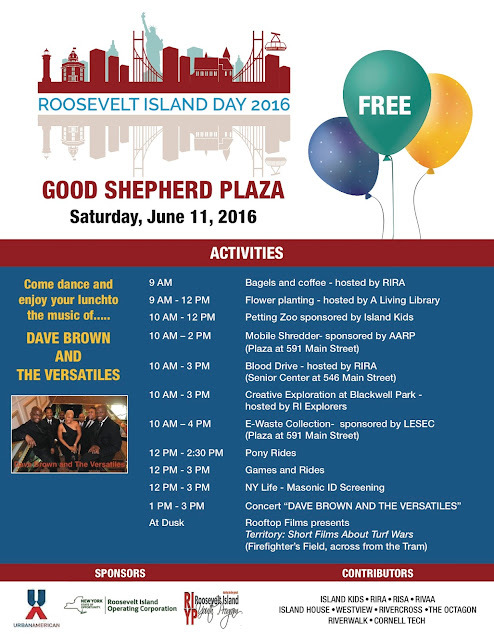 Roosevelt Island Day is always a terrific event to have fun with your family, friends and neighbors. 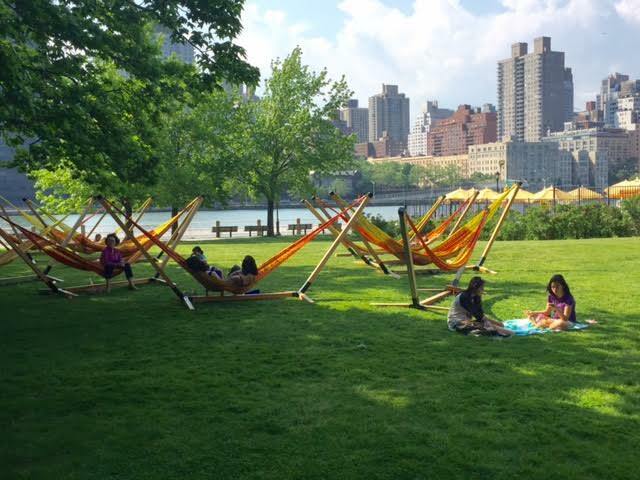 Here are some scenes from the 2015 Roosevelt Island Day. 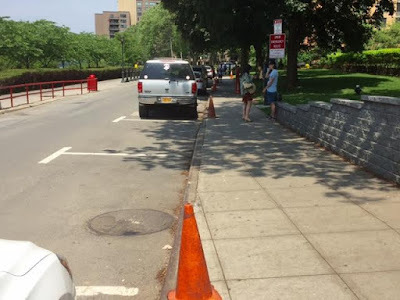 What's The Deal With All Those Traffic Cones Placed Next To Roosevelt Island Main Street Parking Spots? from Starbucks to Blackwell Turnaround in Southtown recently? It sure feels like summer today and with the upcoming Memorial Day weekend temperatures expected to be in the high 80's, it's good to know that the Manhattan Park Pool, Swim Club and Sun Deck opens for the season on Saturday May 28. 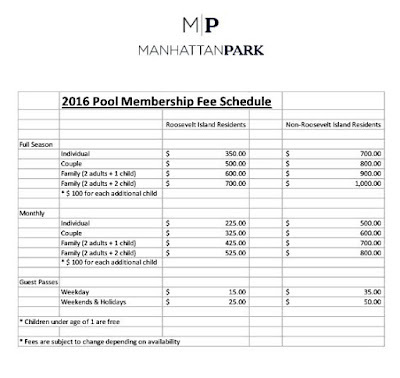 The Manhattan Park Pool Membership Fee Schedule is below. 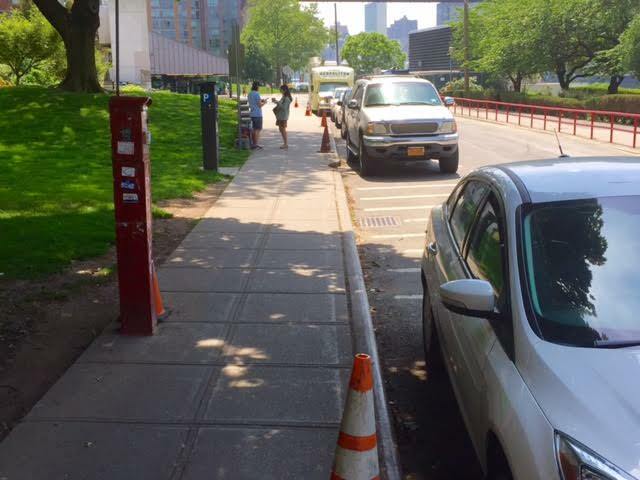 Fees are the same for Roosevelt Island residents. 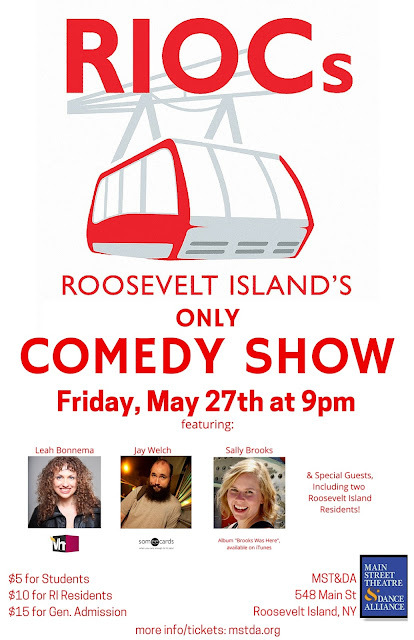 Non-Roosevelt Island residents pay more. 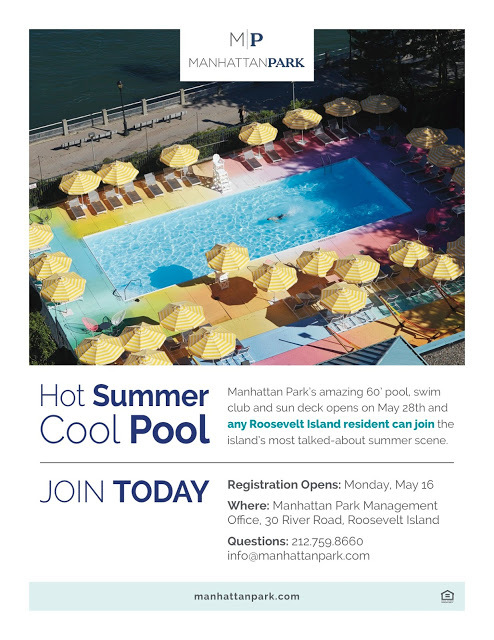 As reported last week, the Manhattan Park Swim Club initially listed higher fees for non-Manhattan Park Roosevelt Island residents to join than for Manhattan Park residents. 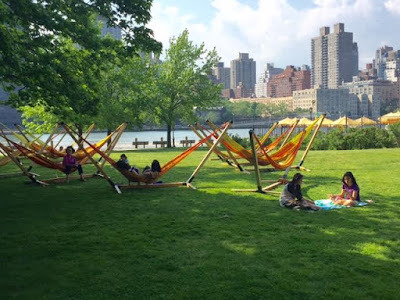 Frank Farance did some research and discovered a provision in the Manhattan Park ground lease with the Roosevelt Island Operating Corp (RIOC) which appears to require Manhattan Park Pool membership fees not to be based upon which Roosevelt Island building a resident lives in. 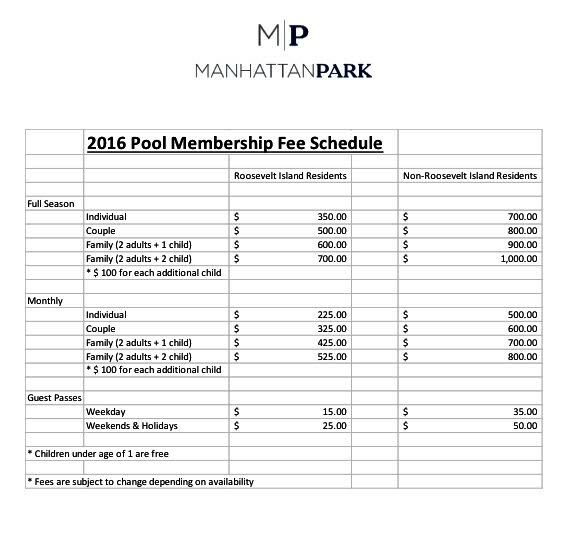 The revised Manhattan Park Pool fee schedule shown above was issued shortly thereafter. Good job by Mr. Farance digging into this issue and good job by Manhattan Park revising it's Pool Fee policy. The Manhattan Park pool is one of two outdoor pools on Roosevelt Island. The Octagon building has a pool but is only open to it's residents. 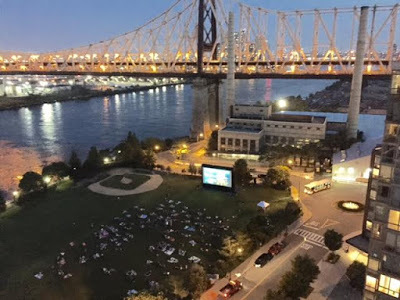 do you have the schedule for the 2016 Roosevelt Island Summer Outdoor Movie? I have an almost complete schedule of the Roosevelt Island 2016 Summer Outdoor Movie schedule at Firefighters Field. 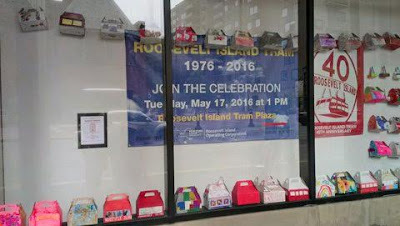 I asked RIOC for the complete Roosevelt Island Summer Outdoor Movie Schedule on May 4. RIOC declined to release the full schedule. Instead, RIOC announces one movie a week as a social media "tease" to the community. 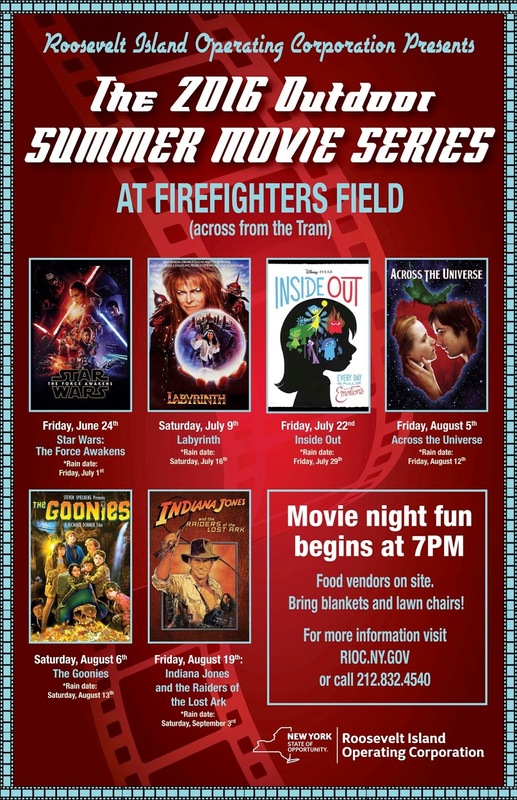 The final Roosevelt Island Summer Outdoor Movie at Firefighters Field will be announced next week by RIOC. Will include the name of that movie as an update when released. 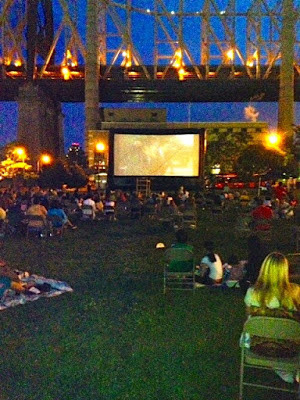 UPDATE 6/7 - The final 2016 Roosevelt Island Outdoor Movie will be Indiana Jones and The Temple Of Doom Friday August 19 (Rain Date Saturday September 3). R.I.O.C.s (Roosevelt Island's Only Comedy Show) brings some of the funniest and most original stand up to Roosevelt Island. From nationally touring headliners, to unique theme shows, to some of the best stand ups you've never heard of; each month will be hilarious, different, and right here on Main Street. The comedy is PG-13. Parents should use their discretion. Roosevelt Island resident Dan Gessner. 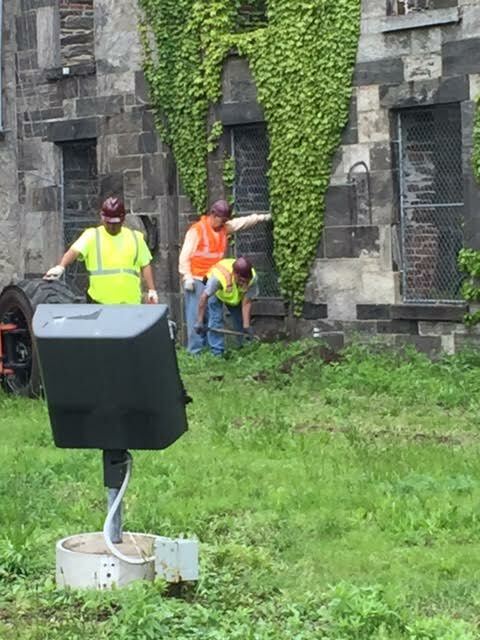 There appears to be some work being done on the Smallpox Hospital today by Building Restoration Contractors Association. What type of work is going on? 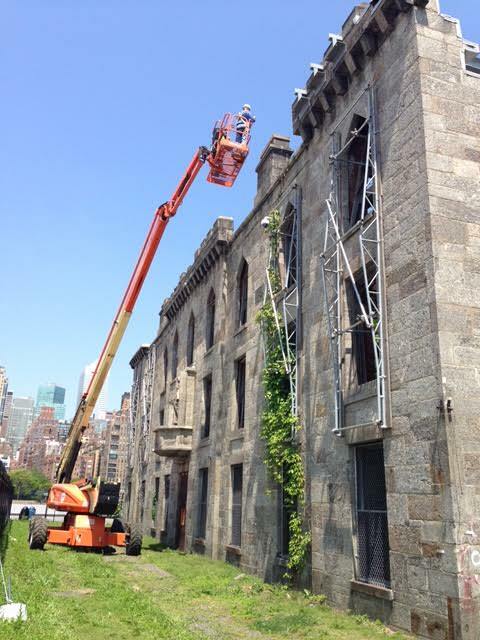 Is there a Smallpox Hospital restoration project starting? We have not started any project. FFP has commissioned a study and have various third parties testing, etc. the structure. 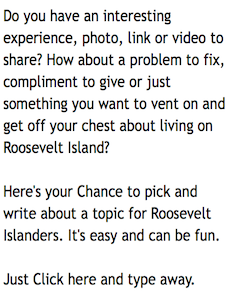 FFP is the FDR Four Freedoms Park. 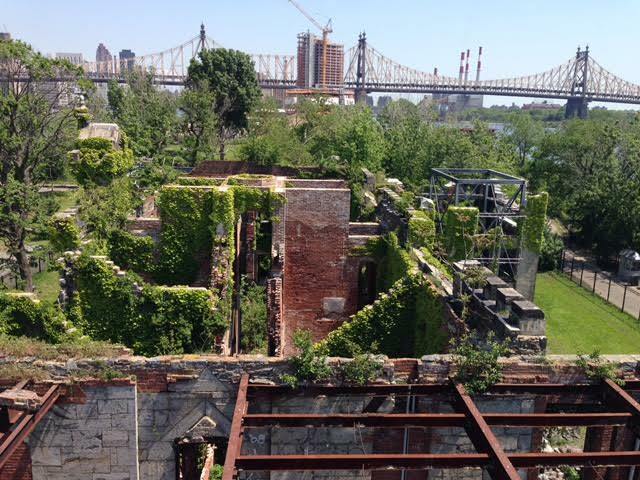 Why is Four Freedoms Park conducting a study of the Smallpox Hospital in Southpoint Park which is RIOC property? Why was there not a RFP seeking bidders to conduct the study? 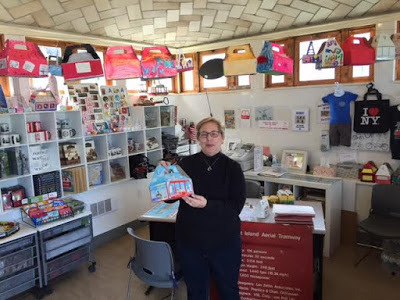 Sally, what is the purpose of the Four Freedoms Park Smallpox Hospital study? The Conservancy is in the middle of a structural study of the Ruin. Funding comes through a grant we received in 2012 from the New York State Office of Parks, Recreation, and Historic Preservation. This study will produce a round of engineering drawings, as well as soil profiles, floodplain review, etc. 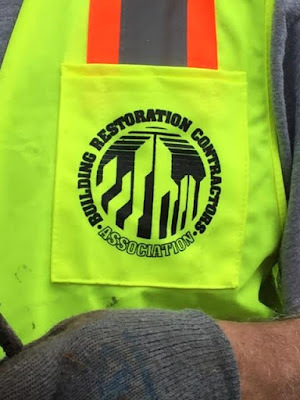 The team you may have seen on site are structural engineers and historic preservation experts. Their boom will be here until Friday. In terms of the RFP, it was published a year ago and was widely publicized: http://www.theruin.org/rfp. The scope is very clear. Selection (which was decided by a team of preservation experts, RIOC, and others) went to a terrific firm known as Walter B. Melvin Architects. They have extensive experience working on Renwick structures. They recently stabilized the failing steeple of Renwick’s Grace Church. and photograph the building core with Cornell Tech and 59th Street bridge in the distance. Stephen, thanks for the background and details. RIOC looks forward to the findings ( we passionately want to preserve the ruins) and it is great that the timing coincides with the proposal of the facilitator. More information on the Southpoint Park Open Space Community Facilitator referred to by Ms. Rosenthal available at this previous post. 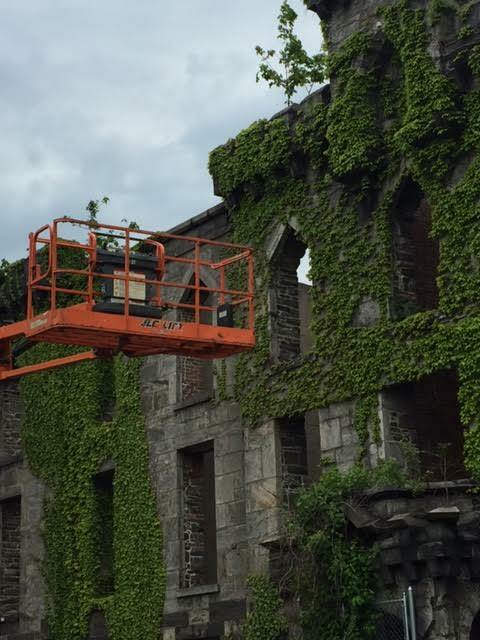 Check out this excellent history of the Roosevelt Island Smallpox Hospital. Here's a gorgeous view from a drone flying over the Smallpox Hospital, FDR Park and Roosevelt Island East River waterfront. 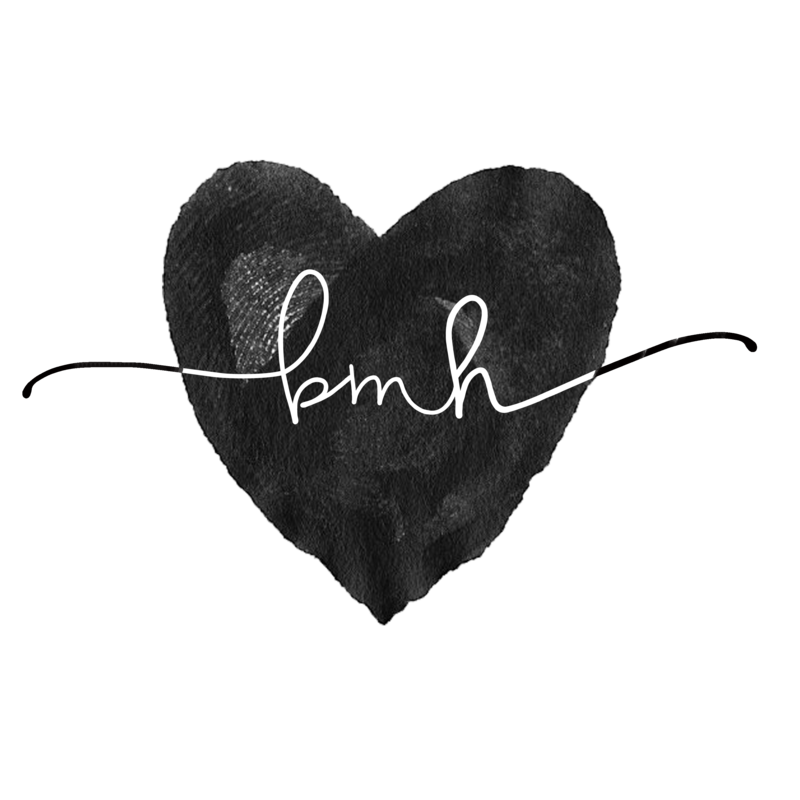 Click on the full screen icon for better view. 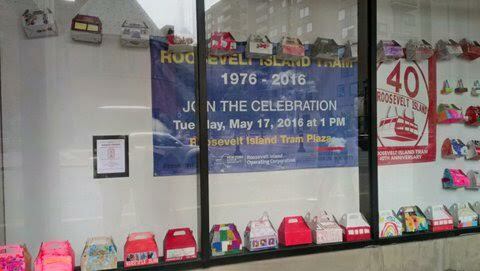 there will be no Roosevelt Island F Train service to Manhattan this upcoming Memorial Day Weekend. 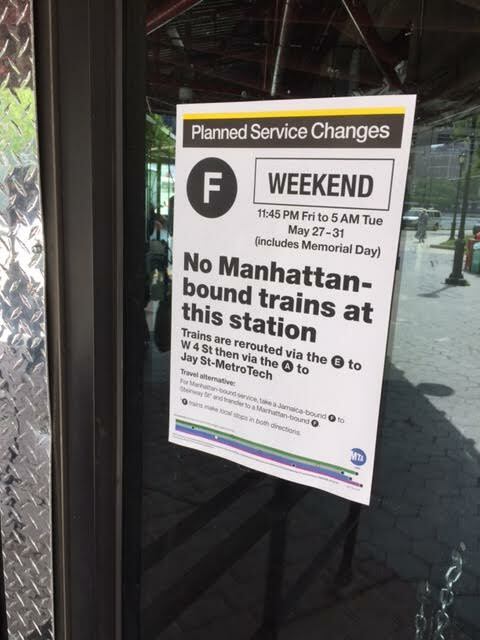 The MTA Weekender web site currently has no information about Roosevelt Island F Train service for the Memorial Day weekend. Bike New York will host a Helmet Giveaway on Thursday May 26 at Good Shepherd Plaza from 3:30 PM - 6:30 PM. Also, on June 11, Bike New York will have another Helmet Giveaway as well as a Bike repair shop for Roosevelt Island Day at Good Shepherd Plaza. Children and Adult helmets will be available while supplies last. One helmet per person. Take a virtual bike ride around Roosevelt Island. Click on the You Tube Full Screen icon for a great view. @Rooseveltisland I know it's been crazy but these last 2 weeks have been too much. Today's evening rush hour was absurdly over crowded. 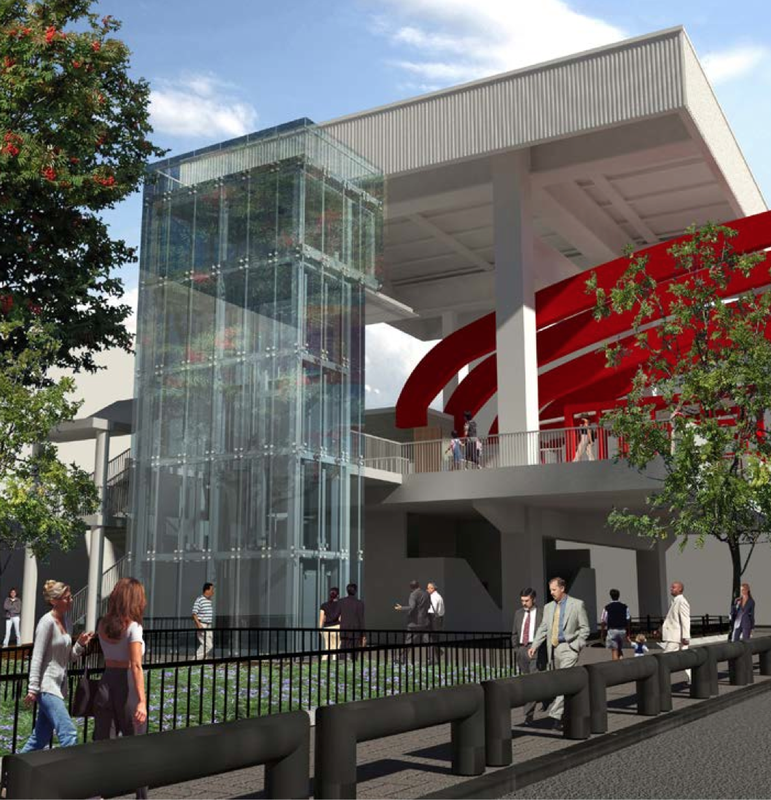 Manhattan Community Board 8 (CB 8) will meet tomorrow, May 24, for a Roosevelt Island Tram Station elevator presentation update. Presentation by Roosevelt Island Operating Corporation (RIOC) and consultants GC Eng & Associates, PC regarding RIOC's Manhattan Tram Station Elevator Modernization Project. 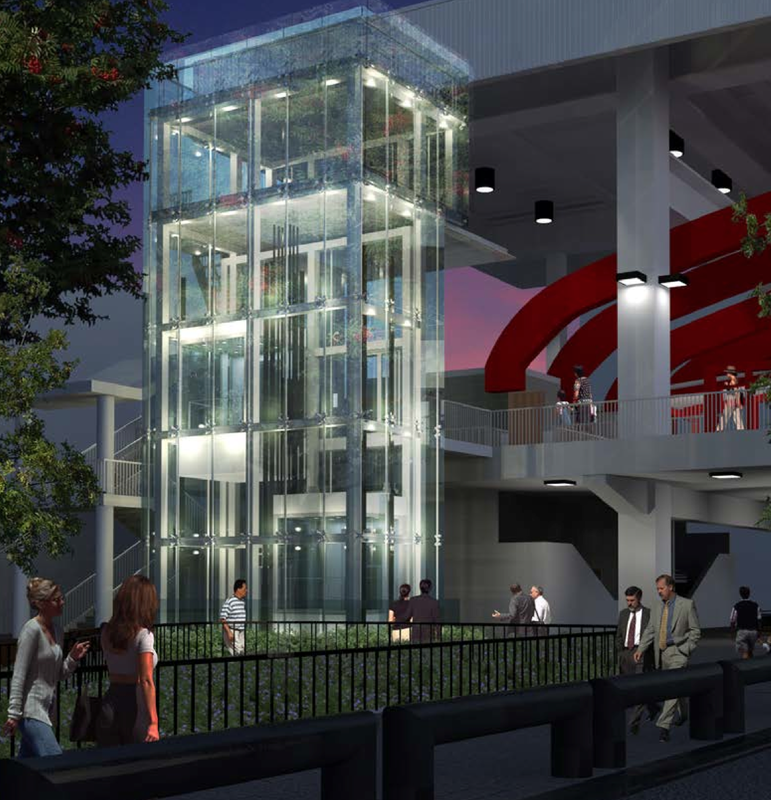 This project involves the replacement of the existing elevator and stair lift with 2 new ADA Compliant Elevators relocated adjacent to the Manhattan Tram Station at 60th Street and 2nd Avenue, and impacts Tramway Plaza. **Wheelchair-accessible access is through the Blood Center’s garage entrance at303-319 E. 66th Street (betw. 1st & 2nd Ave.). Security will guide you to the Auditorium. More on the April 12 presentation, including video, at this previous post. ... A Manhattan resident complained about the possibility of light disturbing the residents of that intersection, including those who live above the bar at the NE corner of 60th & 2nd Ave. Also, Larry Parnes, Co-Chair of the CB8 Roosevelt Island Committee, indicated that the park would lose some space – and since it’s a mapped park, various permissions would be needed before the public parkland could be taken over for the elevator structure. 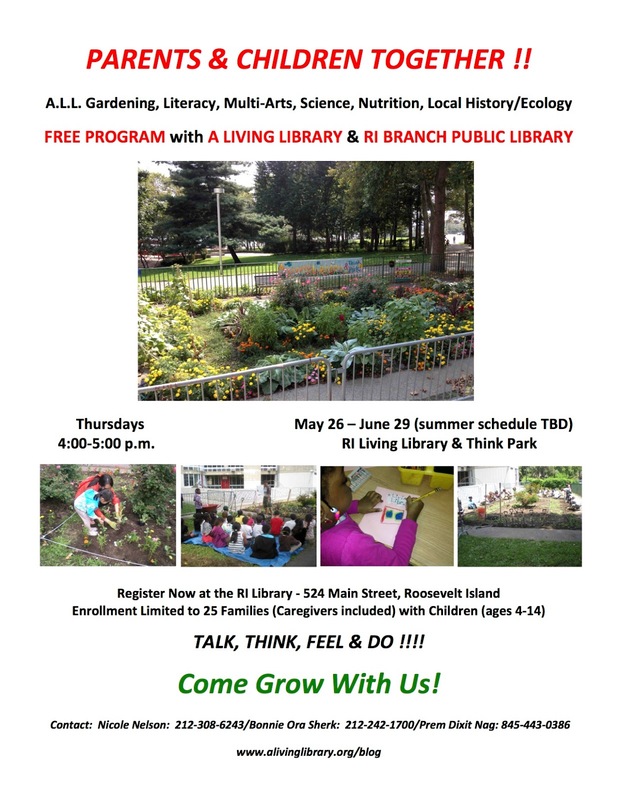 Come to the CB 8 meeting tomorrow to learn what is going on and to ask any questions you may have. Our own Roosevelt Island Wengerd Farms is ahead of the curve with tote bags given out for free at Saturday's Farmers Market to help us reduce our use of plastic bags! On May 5, 2016, the New York City Council adopted the #BYOBag bill (Int. No. 209-A) that will require a 5-cent minimum fee on all carryout bags provided at check-out at all retailers in NYC. The bill goes into effect on October 1, 2016. Thank you to all of our coalition members that made this happen! To keep up to date on the NYC bill, follow BagItNYC on Facebook or @BagItNYC on Twitter. Roosevelt Island's NYC Council Member Ben Kallos supported the bill. Since I signed onto #BYOBag bill, I have joined @CitizensNYC to distribute over 500 reusable bags to get my constituents ready to @BagItNYC.
.@CMReynoso34: Plastic bags account for 7,500 garbage truck trips every year. #BYOBag bill helps environmental justice communities. 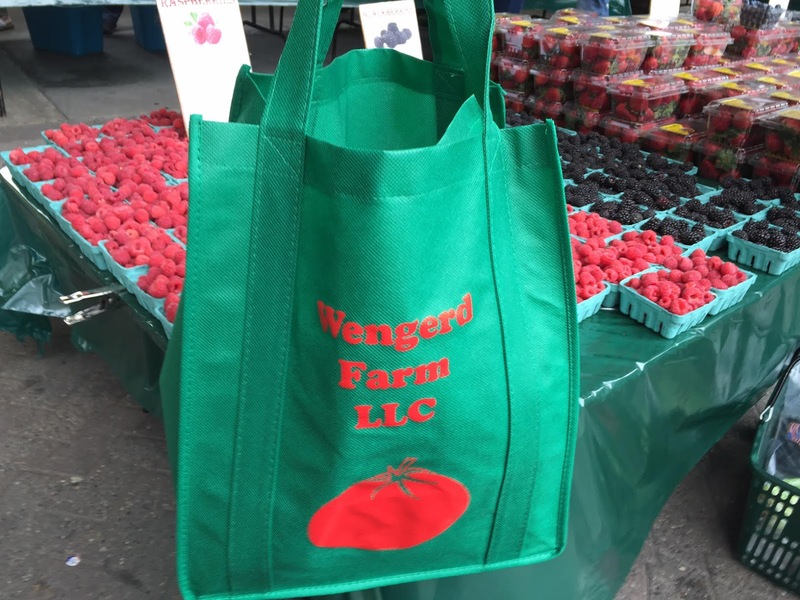 There is still opposition to the 5 cent fee for plastic grocery bags. 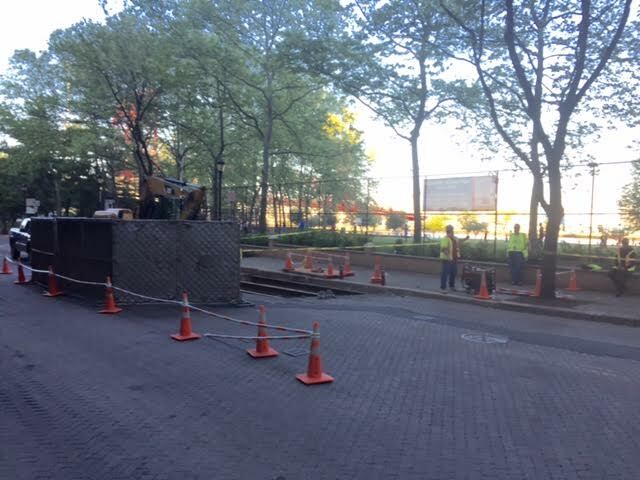 Due to continued Con Edison Gas Main Riser work there will be traffic diversions on Main Street, for the week of Monday, May 23rd, 2016 through Friday, May 27th, 2016. Therefore; there will be “No Parking, No Stopping or No Standing” in front of 591-625 Main Street (Westview Buildings) beginning 12:00AM, Monday, May 23rd, 2016 through 11:00PM, Friday, May 27th, 2016. Vehicles parked in this area during this time will be summonsed and/or towed. Further, the sidewalk on the East side of Main Street, in front of Capobianco Field, will be closed to pedestrian traffic. Pedestrians may cross over to the West side of Main Street either at the crosswalk near 591 or 625 Main Street. 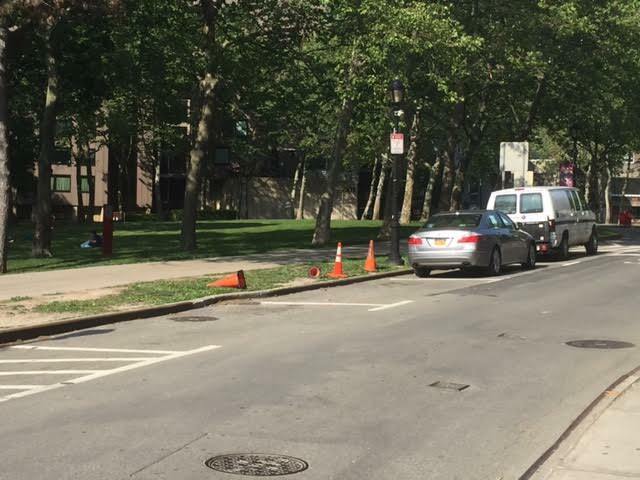 Con Edison will continue to provide RIOC with a projected work schedule, which will be made available to residents and merchants in future Everbridge Advisories. Urban American Management has advised that due to building facade work, Main St. will be reduced to one lane of traffic between 575 Main St. (Island House Bldg.) 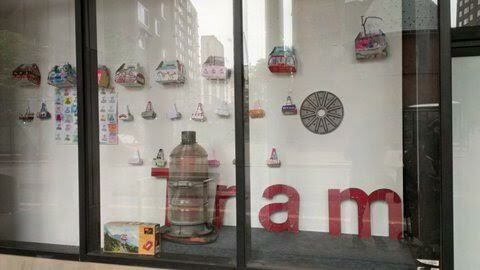 and 599 Main St. (Westview Bldg. 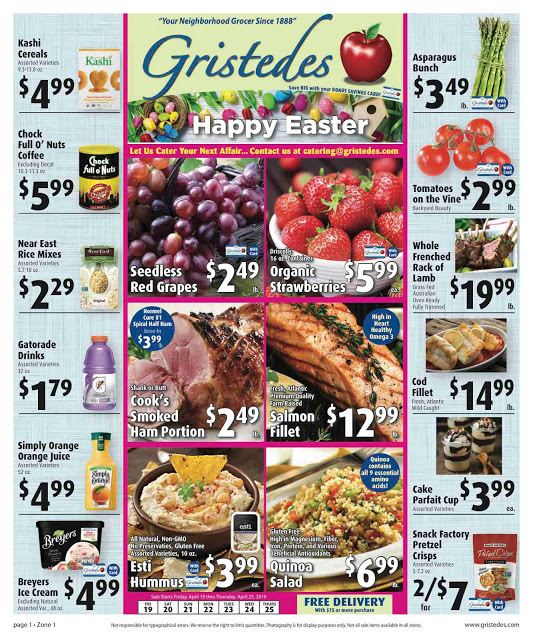 ), DAILY beginning Monday, May 23rd, 2016 THROUGH Friday, May 27th, 2016, from 8AM to 6PM. In order to facilitate this work, there will be NO PARKING, NO STOPPING, OR NO STANDING on the West side of Main St. between 575 Main St. (Island House Bldg.) 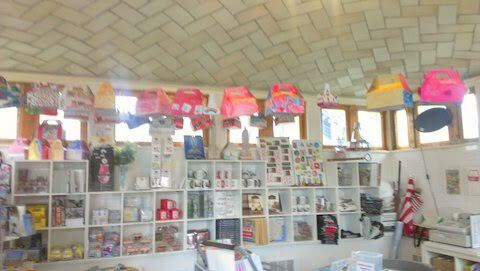 and 599 Main St. (Westview Bldg. ), Monday THROUGH Friday from 7AM - 7PM. Vehicles not moved by 7AM on these days will be summonsed and/or towed. 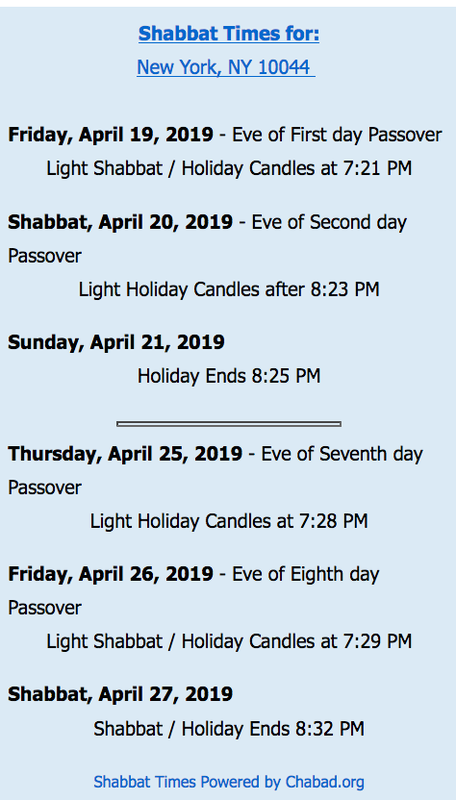 Flag persons will be on site to redirect traffic during these times. 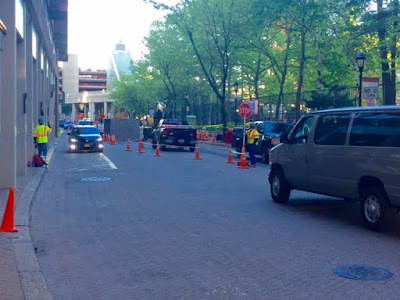 Further, during this work, from 8AM to 6PM the crosswalk at 580 Main Street will be closed to pedestrian and vehicular traffic; please utilize the crosswalks at 560 or the temporary crosswalk located opposite 595 Main Street. 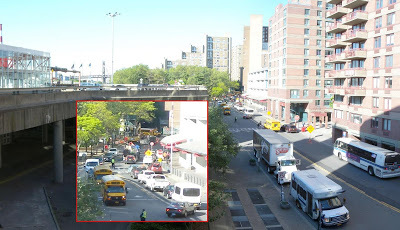 work caused a huge traffic jam during that morning's rush hour from Main Street over the Roosevelt Island Bridge to Vernon B'lvd in Long Island City.